Presses of all types are used in metalworking. They are used to blank out miniature watch and camera parts or forge ship anchors and every thing in between. Hand and power presses are used for bending, punching, blanking, riveting, forming and forging. The one thing all presses have in common is that they use dies. 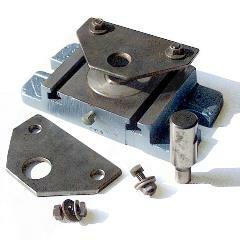 Most presses have their dies mounted in "diesets". These are a system of plates and guides that hold one or more punches and dies in alignment, support and guide the work and often feed it. 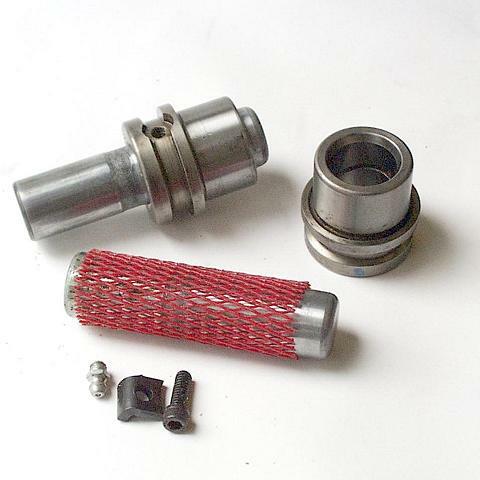 A dieset to make bottle caps has the same components as one use to stamp out auto body parts. The only difference is a matter of scale and the size of the press required to do the job. This article is an introduction to diesets and press components. Hopefully it helps you be more productive in your shop. As we have time we will add diagrams and more details. If you have a specific press or dieset problem let us know. A press is only half a machine without a dieset. Diesets are the dies, holders and guides all in one package. Generally they can be moved from one press to another without change. 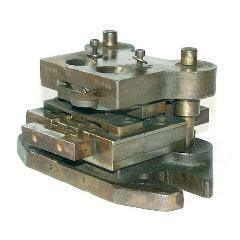 A dieset that works on an arbor press can be used on a flypress, punch press or hydraulic press as long as there is sufficient force to do the job. 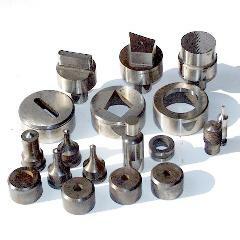 Many press tooling components are available from companies such as Cleveland Tool Co., Danly Die Sets, Roper Whitney and others. Using standard precision components makes die and dieset building much more economical than building from scratch. An off the shelf item that makes it easy to change dies and strippers on small fly presses and punch presses. Many pieces of press tooling are made from scratch. These are some examples. Cleveland Steel Tool Company Punches and Dies for presses and ironworkers. Danly Diesets Dieset components, springs and dies.